Dan Patrick is the best conservative candidate in the race for Texas Lieutenant Governor. It seems as though I am not the only person with that opinion. Dan Patrick has easily gained the most Tea Party support of any candidate in the race. Did you know that Dan Patrick has also gained an enormous amount of support from the Minority Community? Minorities are actually very conservative in their beliefs. The problem is that the liberal Democrats have brainwashed them into believing that Republicans are bad. The amount of support from the minority community that Dan Patrick has gained is very good and very important. 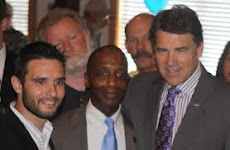 HOUSTON – Dan Patrick, the authentic conservative candidate for Lt. Governor, has received 24 TEA party endorsements because of his strong fiscal and socially conservative record. His message of prioritizing border security, cutting property taxes and reforming our public schools has resonated with the conservative voters. This message has also produced support from the minority community. Today Dan Patrick received the endorsement of Bill Calhoun, Chairman, Texas Federation for Republican Outreach*. Mr. Calhoun is a long serving leader in the Texas Republican Party and has been appointed as a delegate to the White House Conference on Small Business by both President Reagan and President Clinton. He was also appointed to the Texas Advisory Committee of the U.S. Commission on Civil Rights by President George W. Bush. His endorsement of Dan Patrick is largely based on their mutual desire to improve public education and provide more choice options. Last week, Republican Hispanic Citizens in Action met and heard from the candidates for Lt. Governor. At the end of the meeting, the attendees voted in a straw poll and supported Dan Patrick over the other candidates. The Republican Hispanic Citizens In Action (RHCIA) is Houston’s most active and fastest growing Republican Hispanic organization. For more than four years RHCIA has been building a foundation of committed individuals interested in conservative government and promoting Republican candidates. *Organization listed for informational purposes only.